Could your agency benefit from this proven and effective treatment? Why would your agency be interested in YW? You serve 8 – 12 year olds with EMOTION REGULATION being one of their primary skill deficits. You are looking for innovative and effective ways to ENGAGE them more in treatment. You and your agency is open and willing to CONSIDER and DIALOGUE about how a program like YW may be a possible treatment pathway that you could deliver. More focused — able to stay on task or redirect attention from engrossing activity. More aware of own behaviour patterns — kids and parents see more clearly how and when they are acting in ways they do and don’t want. More connected — many parents reported feeling more empathy and understanding towards their child. You can find more information about our in clinical research study here. We respect that there are many ways to teach kids about “emotion regulation” (ER) and that the field of theories and research around ER is also diverse. In seeing other approaches to teaching ER in clinical context, we do notice that YW seems to be unique in some key ways. First, we prioritize in making the lessons very compelling and the learning of ER skills as easy and fun as possible (rather than only educating them or asking them to do what is hard). 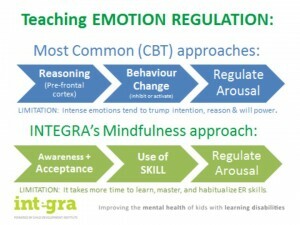 Second, is that the actually skills we teach kids to regulate their emotions involve what we consider to be a “bottom up” rather than a “top down approach”, which begins by activating the pre-frontal cortex and trying get kids to notice and think and then using their will-power and motivation to change behaviour next, eventually evoking a change in arousal. We often observe that when emotions are intense enough (as they often are for our clients) they have a very hard time to engage their pre-frontal cortex nor to mobilize their will-power to make behavioural changes. In contrast, our approach to ER is to start with an easier and more primitive step — simple awareness (based in Mindfulness) — activating children’s ability to just perceive “what is” happening and surrounding that with acceptance to alleviate any self-judgment, confusion or overwhelm. Next, we invite them to use a very brief skill that is memorable, concrete and easy to use. The use of the skill seems to immediately begin regulating arousal on the physiological level (they sense muscles relaxing, their thoughts settling, their breath slowing down, etc.) which validates them to continue. Our clients — the kids and parents — report to us that this approach seems to us to be very useful whenever they are in the midst of emotional turmoil and overwhelm. As effective as it is, we also know that it takes time to learn and practice these kinds of ER skills for it to become habitual and to generalize outside of our clinical context. That is why the YW program runs for 20 weeks and many kids continue for second or third terms to increase their abilities to regulate their emotions more quickly. We are on the lookout for agencies who are interested in what we do in YW and discovering how we may be able to work together collaboratively to serve more kids and their families in more innovative and effective ways. Interested agencies select key clinical staff to be trained by the YW founder and coordinator, David Jurasek. We provide all instructional material (updated manuals, website, videos, etc.) for your agency to deliver the program at the highest level. As you deliver the program to your clients, we work together to capture the unique outcomes and discoveries through joint research. We also provide ongoing consultative and mentorship support, because the quality and care of our instructors translates into the quality and care that families and kids experience. All for a very reasonable price (our priority is making positive long-term impacts in the lives of kids through innovation and excellence — not profit). The Integra program (CDI) has been at the forefront as an advocate and pioneer of innovative services for families with kids/teens with Learning Disabilities and Mental Health challenges (LD/MH) for a long time. As part of CDI, with it’s diverse and successful programs for children and teens across Ontario, we are in it for the long haul. Standing at the cutting edge of innovation, while deeply embedded in communities, we see emerging trends in Mental Health and the kinds of services that are most needed and sought out. At YW, we imagine the future of mental health services will be many more programs like ours that engages kids in activities they already desire and love, within therapeutic communities of collaboration and respect. Can your agency imagine partnering with us in delivering and researching an innovative treatment like YW, that is a meaningful and fun part of children’s lives? If your answer is YES, lets start a conversation!